This is a long trail, steep in places but not a difficult climb. It will take you about 1 hr 30 min to complete and is 3 km long. The trail starts and ends at the Fragrance Garden. Walking clockwise it follows Smuts Track, beside Skeleton Stream, as far as Skeleton Waterfall on the 300 m contour path, and crosses Nursery Stream twice on the return path. The Kirstenbosch forests are full of large yellowwoods (Podocarpus latifolius), known as the ‘real yellowwood’ by the woodcutters for its sought-after, valuable timber. They are quite easy to spot: look for the bark peeling off in narrow strips in older specimens and its glossy, narrow leaves crowded towards the end of the twigs. It is the only yellowwood that is native to the Kirstenbosch forest, although the Outeniqua Yellowwood (Podocarpus falcatus) and the Breede River Yellowwood (P. elongatus) have been planted in gardens nearby and bats and birds are spreading their seeds into the forest. Skeleton Stream runs most of the year and the waterfall is at its most impressive in winter, particularly after rain when the river is flowing strongly. 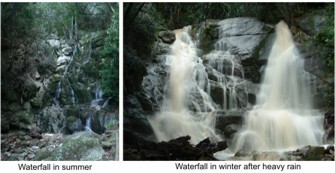 The waterfall runs over granite rock, which is the bedrock of Kirstenbosch. Smuts Track is named after Jan Smuts (1870-1950), twice former Prime Minister and a keen hiker and botanist, as it was one of his favourite routes up Table Mountain. It is not known what or whose skeleton the gorge and stream were named for. Also on this trail is the drinking fountain commemorating Jack Marais, Curator, 1961-1980, who led the 25 year campaign to clear the estate of alien trees. It is largely due to his foresight and determination that the Kirstenbosch forests are so well on the road to their original magnificence. Go to our plant information website to find out more about South African yellowwoods.